SAN GABRIEL, CA – San Gabriel Unified’s Coolidge, Roosevelt and Washington Elementary students acted, danced and sang their way through popular movie scenes, significant moments in history and iconic pop songs during a series of musicals, concerts and variety shows highlighting the District’s keystone arts and music education programs. Four Coolidge Elementary third-grade students clad in tan jumpsuits danced in circles to the iconic “Ghostbusters” theme song before striking the Stay Puft Marshmallow Man with silly string, earning raucous laughter from parents, staff and community members. The comedic act was a highlight of the Coolidge Variety Show, which featured 115 students in 16 vocal and instrumental music acts, dances and skits on May 26. Roosevelt Elementary’s Music Immersion Experience (MIE) program held its spring concerts on May 23 and 24, displaying student progress with through choral, violin, ukulele and bomba drum performances. MIE Coordinator Samantha Theisen said performing in front of an audience is one of the most important aspects of the MIE program since it provides positive reinforcement to students after many months of practice. Washington Elementary School fifth-graders, exasperated by the thought of another historical play told by President George Washington, invited Betsy Ross to narrate “The American Revolution” musical staged on May 23. Students transformed into revolutionary figures like Paul Revere, John Adams and Thomas Jefferson and sang their way through the founding of the United States, complete with kicklines and humorous asides that garnered laughter and applause from the audience. The musical and its costumes were funded through a grant from the Assistance League of Arcadia. 060117_SANGAB_ARTS1: Coolidge Elementary third-graders Olivia Nunez, Sean Saensook and Francisco Rico act out a comedic “Ghostbusters” skit during the Coolidge Variety Show on May 26. 060117_SANGAB_ARTS2: Roosevelt Elementary third-graders showcase choral talents learned as part of the Music Immersion Experience program during the school’s spring concerts staged May 23-24. 060117_SANGAB_ARTS3: Washington Elementary fifth-graders Garrison Chan and Jack Lindstrom, dressed as James Otis and John Adams, sang of “taxation without representation” during musical retelling of the American Revolution on May 23. 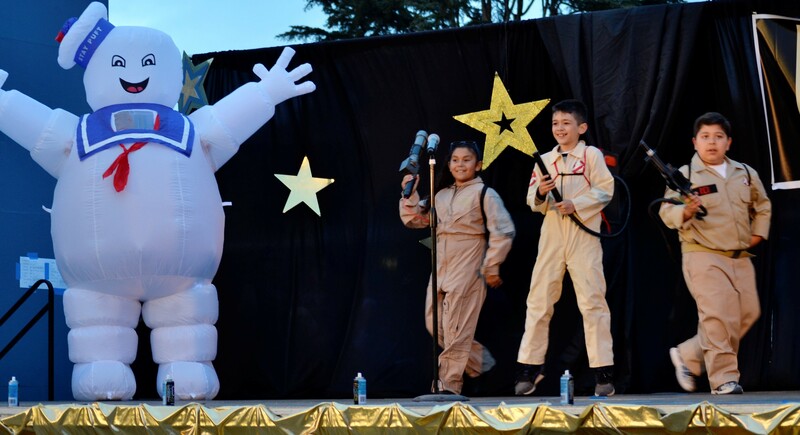 Coolidge Elementary third-graders Olivia Nunez, Sean Saensook and Francisco Rico act out a comedic “Ghostbusters” skit during the Coolidge Variety Show on May 26. 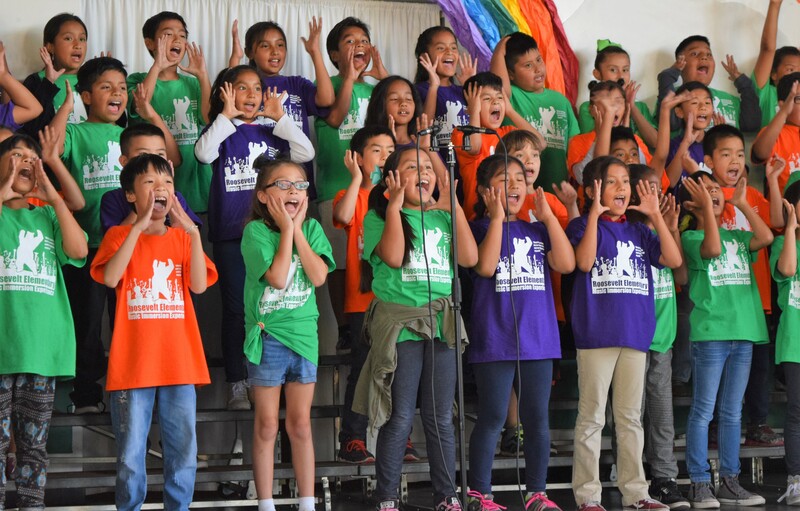 Roosevelt Elementary third-graders showcase choral talents learned as part of the Music Immersion Experience program during the school’s spring concerts staged May 23-24. 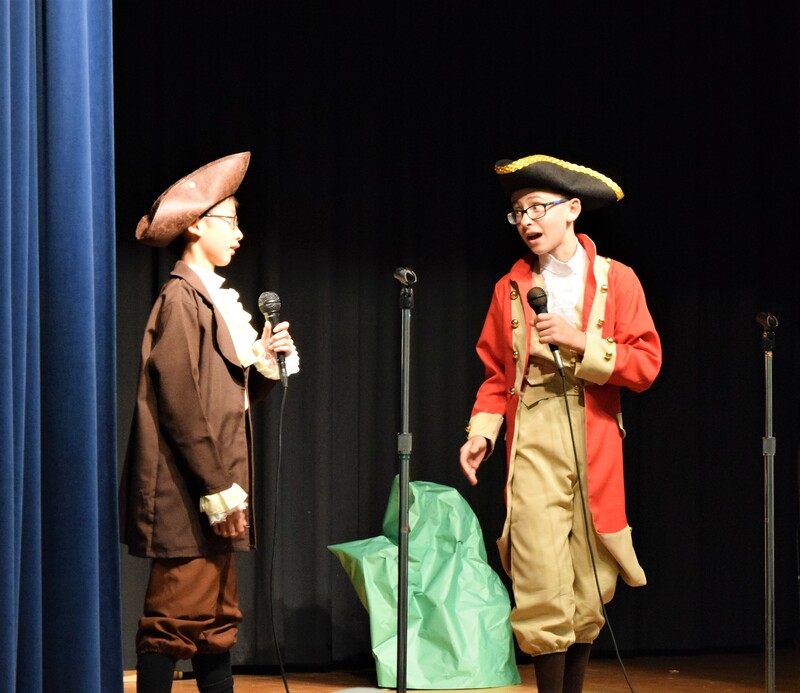 Washington Elementary fifth-graders Garrison Chan and Jack Lindstrom, dressed as James Otis and John Adams, sang of “taxation without representation” during musical retelling of the American Revolution on May 23.